English teenager Reiss Nelson, on loan from Arsenal, scored on his Bundesliga debut but his Hoffenheim side lost to Fortuna Dusseldorf. The England Under-19 forward collected the ball on the edge of the area and fired low into the bottom corner with his first shot to make it 1-1. But Watford loanee Dodi Lukebakio scored the winner from the penalty spot two minutes later. Alfredo Morales had put the hosts in front in the first half. Nelson's debut goal came the day after another English 18-year-old, Jadon Sancho, assisted two goals for Borussia Dortmund as they beat Eintracht Frankfurt 3-1. Elsewhere, Arjen Robben scored a spectacular volley as Bayern Munich maintained their winning start to the season against Bayer Leverkusen. Robben smashed a dipping volley into the top-left corner in the 19th minute for the German champions' second goal. Bayern had fallen behind in the fifth minute when Wendell scored a retaken penalty. Wendell beat Bayern goalkeeper Manuel Neuer after the German had initially saved Kevin Volland's penalty only for it to be retaken because of encroachment from Jerome Boateng. Corentin Tolisso equalised for the hosts five minutes later while James Rodriguez added a third late on after Karim Bellarabi had been sent off for Leverkusen. Corner, TSG 1899 Hoffenheim. Conceded by Jean Zimmer. Goal! 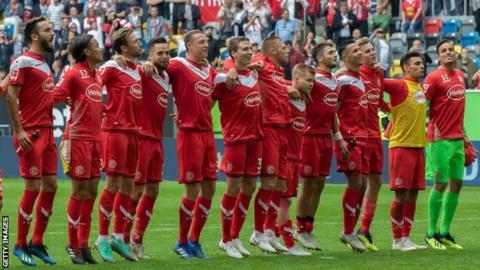 Fortuna Düsseldorf 2, TSG 1899 Hoffenheim 1. Dodi Lukebakio (Fortuna Düsseldorf) converts the penalty with a left footed shot to the bottom left corner. Penalty conceded by Kevin Vogt (TSG 1899 Hoffenheim) after a foul in the penalty area. Penalty Fortuna Düsseldorf. Kenan Karaman draws a foul in the penalty area. Goal! Fortuna Düsseldorf 1, TSG 1899 Hoffenheim 1. Reiss Nelson (TSG 1899 Hoffenheim) left footed shot from the left side of the box to the bottom right corner. Attempt missed. Andrej Kramaric (TSG 1899 Hoffenheim) right footed shot from outside the box is close, but misses to the left. Assisted by Nico Schulz. Attempt blocked. Matthias Zimmermann (Fortuna Düsseldorf) left footed shot from outside the box is blocked. Dodi Lukebakio (Fortuna Düsseldorf) hits the bar with a left footed shot from very close range. Attempt missed. Nico Schulz (TSG 1899 Hoffenheim) left footed shot from outside the box is high and wide to the left. Assisted by Kevin Vogt. Florian Grillitsch (TSG 1899 Hoffenheim) hits the right post with a right footed shot from outside the box. Substitution, Fortuna Düsseldorf. Kenan Karaman replaces Marvin Ducksch. Håvard Nordtveit (TSG 1899 Hoffenheim) wins a free kick on the right wing. Attempt blocked. Andrej Kramaric (TSG 1899 Hoffenheim) right footed shot from the centre of the box is blocked. Assisted by Pavel Kaderábek with a cross. Attempt missed. Andrej Kramaric (TSG 1899 Hoffenheim) left footed shot from outside the box is high and wide to the left. Assisted by Florian Grillitsch. Robin Bormuth (Fortuna Düsseldorf) wins a free kick in the defensive half. Substitution, TSG 1899 Hoffenheim. Reiss Nelson replaces Stefan Posch. Attempt blocked. Steven Zuber (TSG 1899 Hoffenheim) right footed shot from the centre of the box is blocked. Assisted by Andrej Kramaric. Attempt blocked. Nico Schulz (TSG 1899 Hoffenheim) left footed shot from outside the box is blocked. Assisted by Kevin Vogt. Corner, TSG 1899 Hoffenheim. Conceded by Matthias Zimmermann. Attempt missed. Steven Zuber (TSG 1899 Hoffenheim) left footed shot from outside the box misses to the left. Assisted by Håvard Nordtveit. Substitution, TSG 1899 Hoffenheim. Steven Zuber replaces Leonardo Bittencourt. Offside, Fortuna Düsseldorf. Marvin Ducksch tries a through ball, but Robin Bormuth is caught offside.